2) The Climate Interactive Scoreboard – Reporting the State of the Global Climate Deal with the C-ROADS Simulator. From 13.00 – 14.30 on Tuesday Nov. 3, in Barcelona, UNFCCC parties and their analytical teams can get access to the C-ROADS “Common Platform”, a new, fast, user-friendly international climate simulator. Stay for the whole session or drop in: Sala 1, Fira Congress Hotel, across the street from the Southern entrance to the main conference center (Fira Gran Via). 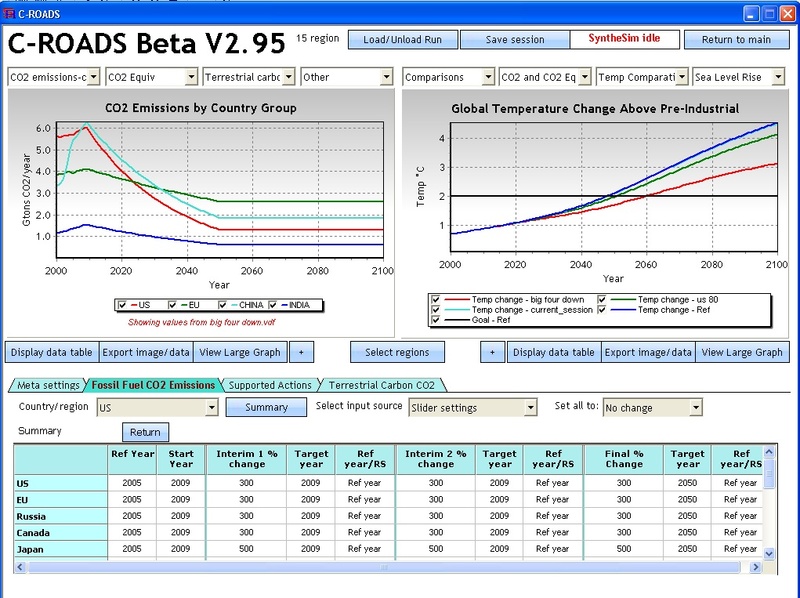 The simulator runs quickly on a laptop computer and allows users to estimate the aggregate climate impacts of the mitigation proposals of 15 country groups. Presenters from Sustainability Institute will demonstrate the new simulator interface, describe the scientific review process, and explain how parties can obtain their own copies and licenses (The cost is being covered by a group of foundations). For questions about this event or to reserve a spot contact Drew Jones: apjones@sustainer.org. The second event is of more interest to the media and civil society groups interested in tools for visualizing and communicating the long-term impact of proposals under consideration with the UNFCCC process. Presenters will introduce the Scoreboard, explain the analysis behind it, and share an assessment of the current “state of the global climate deal” – that is, the aggregate impact of recent proposals to the UNFCCC. From 15.30 – 17.00 in Sala 1, Fira Congress Hotel, across the street from the Southern entrance to the main conference center (Fira Gran Via). C-ROADS was developed by Sustainability Institute, Ventana Systems, and the Sloan School of Management at MIT. More information is available at www.climateinteractive.org .